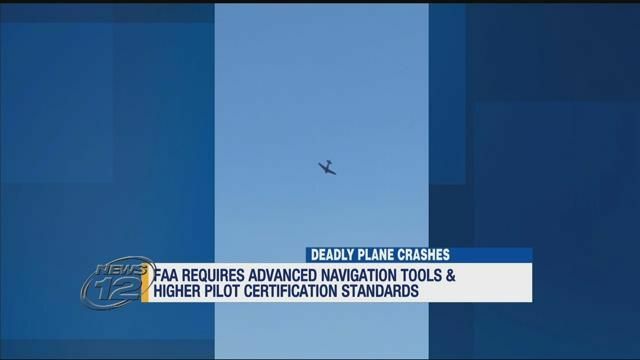 WOODBURY - The Federal Aviation Administration is requiring enhanced tools and training to prevent deadly plane crashes. It comes after two recent aviation accidents on Long Island killed five people in a single week. Newsday says the Federal Aviation Administration is requiring advanced navigation technology in planes, and is also increasing the standards for pilot certification. The Federal Aviation Administration says about 75 percent of crashes are from pilot error, and the remaining 25 percent are caused by plane maintenance issues. As News 12 reported, a plane crash in Melville killed a GEICO Skytyper pilot in May. And earlier this month, four people were killed when a small plane crashed near Amagansett. Better pilot training and advanced technology are the key strategies of a renewed nationwide push to reduce fatal small plane crashes, an effort underscored by five aviation deaths on Long Island in less than a week. The Federal Aviation Administration has mandated more sophisticated navigational tools and higher standards for pilot certification. General aviation experts are campaigning for pilots to make sure they are vigilant about following the rules and learning from their mistakes. Fatalities in general aviation crashes have been on the decline for the past several years, falling from 471 in fiscal 2010 to an estimated 347 in fiscal 2017. Still, the annual general aviation rate far exceeds the rate for the commercial industry, which saw three passenger deaths in the last five years. In 2013, an Asiana Airline jet went down in San Francisco, killing two. A woman died in April after an engine on a Southwest jet exploded and debris struck the plane. The FAA and general aviation campaigns are a recognition that more is needed if the FAA wants to reach its goal of reducing the general aviation accident rate by 10 percent over a decade, the agency said this spring. The federal initiatives came in mid-April, just weeks before the start of the busy summer flying season on Long Island. Two days after Memorial Day, on May 30, a pilot in a World War II-era plane went down in a wooded area in Melville. On June 2, a twin-engine plane with four onboard crashed in the waters off Amagansett. A chief component of the FAA’s safety plan — one that the regulatory agency is working on with the general aviation industry — is developing specific procedures to address in-flight loss of control. The Long Island crashes are under investigation by the National Transportation Safety Board, which could take up to a year or longer to issue its findings. A preliminary report of the May 30 crash released by the agency Friday included an interview with an eyewitness who said the pilot, Ken Johansen, 52, didn’t appear to attempt to recover from a downward spiral. Johansen was an experienced pilot, flying for the Navy and for a commercial airline after he left the military. He was in a North American T-6 Texan, on his way to an air show in Maryland to perform as part of the GEICO Skytypers aerial demonstration team. In-flight loss of control, according to the FAA, accounts for the largest number of small-plane crashes. The second and third most frequent causes are terrain, which includes water, and system component failure. The June 2 crash happened over water. This week, the search for the last victim, William Maerov, 22, was called off. Maerov was with his grandparents, East Hampton luxury developers Bernard and Bonnie Krupinski, in a Piper PA-31 Navajo flown by Jon Dollard. The other three bodies have been recovered. So far, the FAA has put in place nearly 40 measures to improve control. The technological ones range from a navigation tool that uses GPS signals to an instrument called an angle of attack indicator, which can prevent stalls, according to the FAA. The ones related to pilot training stress risk assessment and decision-making, such as identifying the malfunctioning engine and figuring out the best way to make an emergency landing, according to an FAA white paper. This month, the FAA updated the certification requirements for private pilots by focusing on risk management. After getting certified, pilots must make three takeoffs and landings within 30 days to fly with passengers. If the FAA finds out a pilot hasn’t complied, which is discovered through a random inspection, he or she faces fines and decertification. The changes help “everyone know how knowledge, risk management and skill work together for safe operation” in the nation’s airspace, the white paper said. 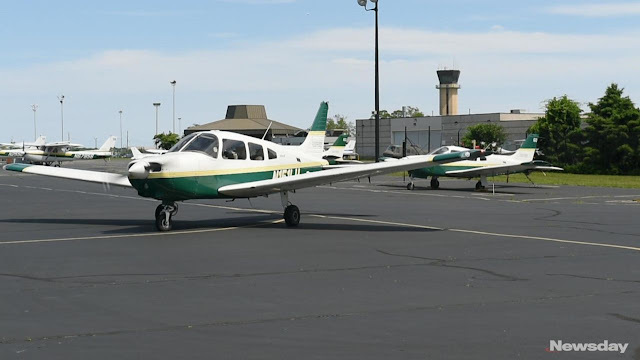 Experts such as Michael Canders, the director of Farmingdale State College’s aviation center, say pilots should make it a top priority for themselves to keep their skills sharp. “Proficiency really is a function of flying. They need to get out, they need to fly, they need to practice the things that may get them in trouble,” he said. Canders pointed to the WINGS program, the FAA’s voluntary training that calls for pilots to fly regularly with an authorized flight instructor. Republic Airport in Farmingdale also offers monthly safety seminars, he said. From spring 2016 to early 2017, there were 10 small plane crashes on Long Island. The high number, including a crash in a Bayport neighborhood, prompted Sen. Chuck Schumer (D-N.Y.) to call for a broad investigation by the NTSB. The findings showed no local factors that would make general aviation more dangerous. 2. Dirty Harry: "A man has to know his limitations." Don’t get between Chuckie Schumer and a camera. That’s an even more dangerous place than being in a GA airplane. It's ALL about safety. Our GA pilot group could use more recurring training and currency/competency requirements. The noted safety statistics are probably pretty accurate, and pilot error seems to be obvious leader. Pilots that don't fly very often are by definition "Rusty", and that's not a good state to be in for either themselves, or their unsuspecting passengers; we've read a lot about that right here! Risk management and judgment are what keep us as far out of harms way as we can get, and staying current helps us to make smarter decisions and be better pilots. We should be doing it without additional regulations, but many do little more than the minimum, and some not even that. Gotta love this "general aviation experts". I am more convinced the "push" for safety has to come from within the aviation community itself otherwise as stated above, "the aviation experts" (and the Schumer's of this world) are going to make more rules and associated costs that have little added value or impetus for increased compliance once people decide they are not being watched. All of us observe people doing their own thing and demonstrating the attitude "to hell with the rules, physics and time proven wisdom". They get away with it for a while and say things like "an inch is a good as a mile" or "you have to die sometime". They seem to decide that since they are not dead (yet) then all is fine and ok. A lot of tears and bad memories are left behind. None of us get to cheat death in the long run. Those rules were not made by us. In my generation we became a business aviation family. It was a life-long dream of mine since first understanding what an airplane is or does. Like many children the homemade parachutes, Lego blocks and paper airplanes were age appropriate. The worst could happen but I would rather die [not] doing what I love rather than demonstrate my arrogance to my surviving family and friends. "I would rather die [not] doing what I love rather than demonstrate my arrogance to my surviving family and friends." Brilliantly said! I couldn't agree more. I also couldn't agree more with the idea that members of GA need to make safety an integral part of flying, and not rely on outsiders to try to regulate us there.